TITAN Fuel Filter Heaters are 0.075" (1.9mm) thin flexible heating pads that are attached to the outside of fuel filters. The TITAN Fuel Filter Heater incorportes an adjustable velcro band that facilitates the ease of fitment to numerous sizes of oil filters. Cold weather creates fluid flow problems with fuel and oil filters. Fuel and oil becomes too thick to pass through the fine pores within the filter element; consequently the fuel gels and it won't flow with the result that the engine will not start. Fuel filters also suffer from additional restrictions if there is any water or moisture in the fuel which will freeze in the filter element. Engine wear is increased when the flow of lubricating oil is restricted in the filter element. The TITAN Fuel Filter Heater warms the filter housing to summer temperatures; this unplugs the gel in the oil filter to increase the flow and allows for sufficient fuel flow to start the engine. 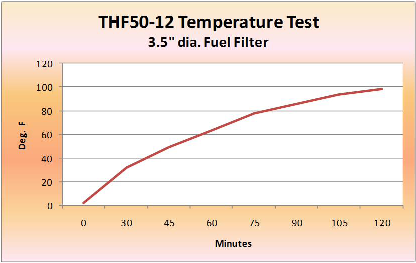 The fuel temperature will increase above the pour point and melt any fuel/ice slush; this allows sufficient fuel to flow to the injection system ease of engine start up.